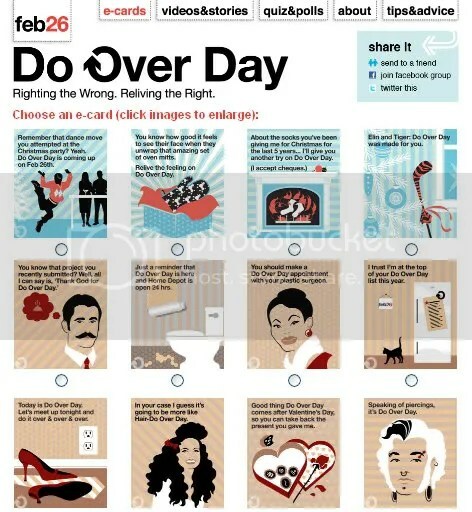 Do Over Day is Feb 26th All Over The world! National Do Over Day is the magic occasion in which you really can take back a moment or re live an emotional response to something. The event can be positive or you could use the time to turn something negative into something positive – or I suppose you could go entirely negative and then perhaps do it over again next Feb 26th. What I’m saying is the opportunity exists on that day to actualize an emotional crumb and sweep it clear one way or the other. On the Do Over Day National Holiday website you will find some funny bits and tips, tactics, videos and amusing ecards to help you on your journey. Do you know how many people regret talking to an attractive stranger, and listed this missed opportunity as the number one thing they wish they could do over? I dont know either – you will have to visit the site to find out. I do know that the stat prompted me to consider building a website for missed opportunities.